Out on Disney Blu-Ray 3D is Tim Burton's latest stop motion animated film, Frankenweenie. Born from his imagination, Frankenweenie is an updated full-length version of his short film of the same name – created at the beginning of his career shortly before he came into his own by directing Pee-Wee's Big Adventure. The basic premise of the plot follows the classic Frankenstein – a scientist reanimates the dead, only this time, the scientist is a kid and the dead is his beloved pet dog. Unfortunately while the story worked as a short film, it falls apart as a full-length film. Victor Frankenstein is the lead character in this film (apart from his dog that happens to be named Sparky). Voiced by up and coming actor (and relative unknown) Charlie Tahan, Victor prefers to play with his dog and work on science projects rather than play with friends. Forced by his parents to play sports, he ends up being good at it while at the same time causing the event that puts the plot into motion by killing Sparky (off-screen). His parents are voiced by Catherine O'Hara and Martin Short, who both voice multiple characters. Next door to the Frankensteins are the Burgemeisters (more on those little gags later) who have their niece Elsa Van Helsing living with her. She is voiced by Winona Ryder, who, along with the substitute science teacher voiced by Martin Landau, portrays some additional emotion into their characters – emotion that really was lacking in this film. The story had many sidebars that were never developed, and therefor unnecessary. Mr. Burgemeister didn't like Sparky going into his flower beds, and yes, while Sparky eventually does destroy them, this story line did nothing for the plot as a whole. Additionally Elsa Van Helsing was never fully utilized other than as a pawn for Mr. Burgemeister and eventually the cliché maiden in distress. There were hints about developing that character's relationship with Victor, and it was never explored enough (much like Sparky getting into trouble). The movie comes down to being about man's best friend and how far someone would go if he was lost. But by the time the ending comes, there really is no moral of the story and no lessons learned by the leading characters, and they just "grow" without being developed over time. To make things even worse, it seems like more attention was spent on putting in gags. Gags such as Mr. Burgemeister (the villain from the stop-motion Rankin Bass Santa Claus Is Coming To Town), a gravestone that says "Goodbye Kitty" with a very familiar looking kitty drawn on it, and even the fire department is from Station 51 (Emergency!). While those things may have been meant as homage, it doesn't work with the premise of this film. Now the story couldn't ruin the beautiful artistry done in this film. This is probably the finest stop-motion animation I have ever seen – being to the point that I thought it was CGI rather than stop-motion. The only reason I could know for sure is that the images from Blu-Ray (in both 2D and 3D) are so crystal clear you can see where the animators disturb the ground when they make changes in the figures between frames. It is also a very nice film in 3D with most scenes done properly – to improve the depth of field in certain shots and to exaggerate perspective on others, but unfortunately this movie does use a higher number of unnecessary "in your face" 3D gags that aren't necessary for the story but rather to remind the audience what 3D can do. So it's not a "must have" for your 3D collection like several other films I have reviewed. The movie comes in a proper value pack – including the 3D version, a 2D Blu-Ray, a DVD and digital copy. The 2D Blu-Ray adds a few bonuses, including the short "Sparky versus the Space Monsters" and a making of featurette – but the gem is the original short film of the same name. Filmed in 1984 and starring Shelley Duvall (The Shining), Daniel Stern (Home Alone) and Barret Oliver (The Neverending Story). So while its low budget, the story shines when it didn't need to be filled with space, and if you are a fan of Tim Burton's work getting this Blu-Ray just for this short might be worth it. Additional bonus materials include a featurette on a traveling exhibit and a music video – both of which are also on the DVD. Download Frankenweenie from the iTunes Store in Digial HD. 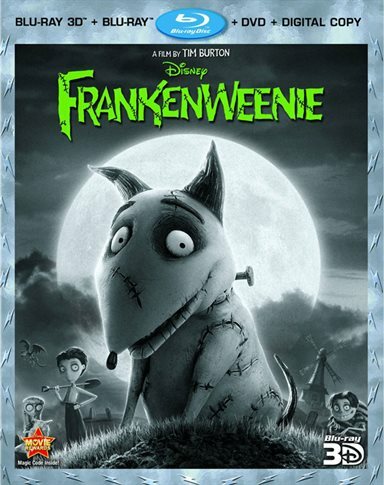 For more information about Frankenweenie visit the FlickDirect Movie Database.